It will be beneficial for every business to adapt to the continuously evolving technological landscape and take advantage of innovations that come their way. There is now an abundance of systems and tools which businesses can utilize to increase their productivity, efficiency, and ultimately, their profitability. If you’re a business owner, it is therefore in your best interest to utilize such systems if you want to see dramatic improvements in your overall operations. One of the most established providers of such enterprise software solutions is SAP®. You may read more about the company and how SAP® products and consultants can help your company from our blog. In this article, we look into SAP® from an economic perspective and see how you can hire SAP® specialists in the most practical way. WIth more than 365,000 customers from over 180 countries, and with offices in over 130 countries, it is the world’s third largest software company. 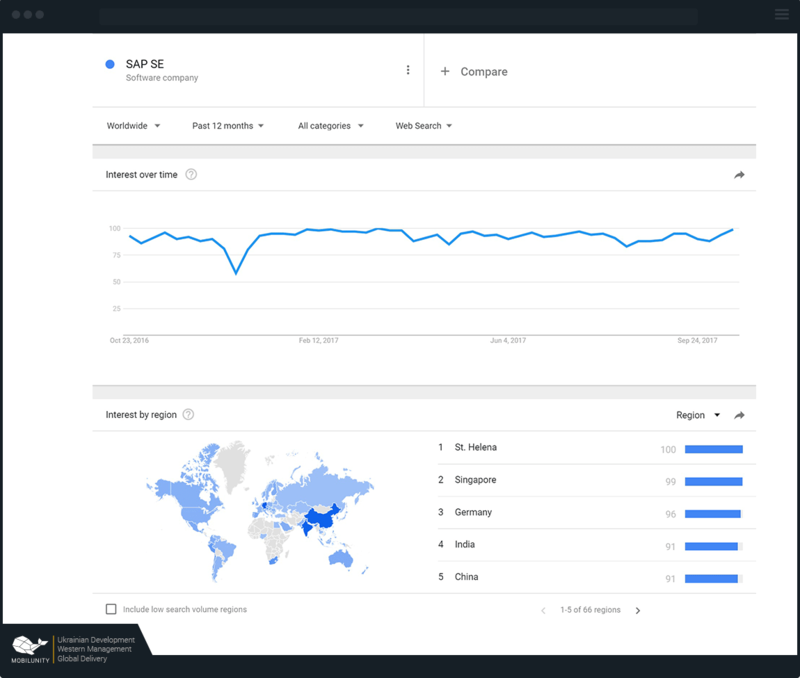 According to Google Trends, SAP®’s popularity in terms of percentage in Google Search count is highest in St. Helena, Singapore, Germany, India, and China. If you’re planning to implement any SAP® system within your business, hiring a SAP® consultant may be critical. A SAP® team knows about all of SAP®’s different products and which applications each of them is best for. A SAP® consultant is effective in communicating with the customer to evaluate his business needs and determine which product or set of products would best suit his needs. The consultant also knows how to integrate SAP® systems with each other and with external systems to make the system work smoothly with the rest of the systems in use by the business. Moreover, the consultant also knows how to best customize each product to tailor it to the specific requirements of each company. There are many avenues through which you can hire consultants skilled in SAP® technologies. Here are three common ones. The most direct way of SAP® hiring would be to find consultants from your local market. You can do this by posting SAP® jobs (such as SAP® Jobs in USA or SAP® Jobs in UK) on job portals such as LinkedIn, Glassdoor, or Indeed. This traditional route tends to be quite expensive, however, because consultancy rates in many countries tend to be high. It may also involve long-term contracts, as well as having to pay for taxes and insurance, which are typical of local hiring arrangements. You can also hire freelance SAP® specialists through one of the many freelance portals like Upwork, Freelancer, and Toptal. This method can be very cheap as the competition among freelancers is intense, and payment is typically via your freelancer’s SAP® consultant hourly rate, but the quality of work you will get may be highly uncertain. Moreover, reliability is at risk in this set-up, because the freelancers you hire may stop responding to you at any time, leaving you and your project in shambles. You can also hire dedicated SAP® specialists from third party companies that provide dedicated professionals. In this manner, your SAP® consultant will work for you full time, but will remain in their company’s office, much like in a remote job arrangement. In this way, you can save a lot of money because aside from not having to allocate physical resources for your consultant, you also won’t have to pay for taxes, insurance, and other expenses. Moreover, you won’t have to worry about being tied to long-term contracts. You can also enjoy the low professional fees of some countries without having to physically relocate there. Most importantly, you enjoy the reliability and accountability that you get with local hiring. 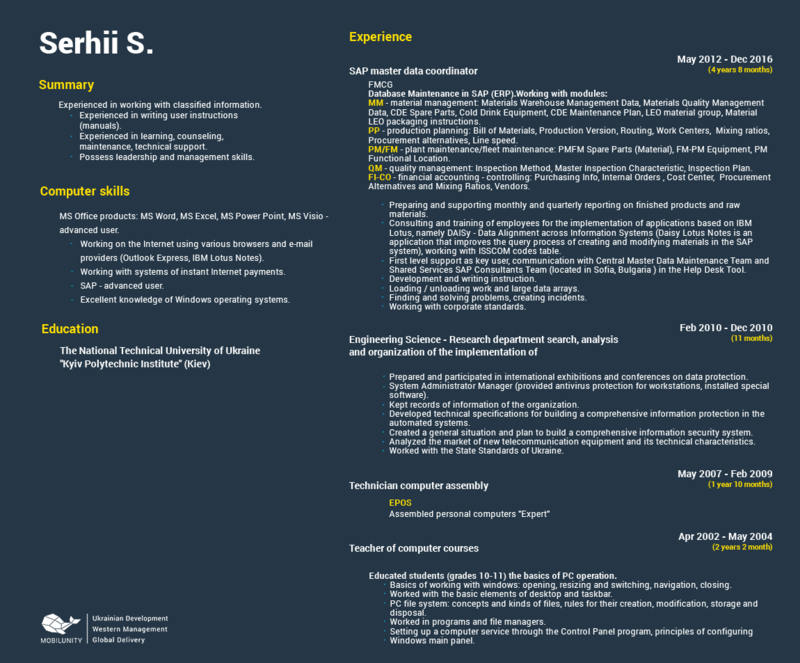 Comparing the three methods, we can see that hiring dedicated developers is the most practical way to hire a SAP® consultant, as it combines the reliability of local hiring with the low cost of hiring freelancers, giving you the best of both worlds. For example, if you require SAP® Basis remote jobs USA, it’s much safer and more practical to hire dedicated professionals than to hire freelancers. From the above figure, it is clear that Ukraine offers the most economical rates for SAP® consultants, while SAP® consultancies in USA prove to be the most expensive. 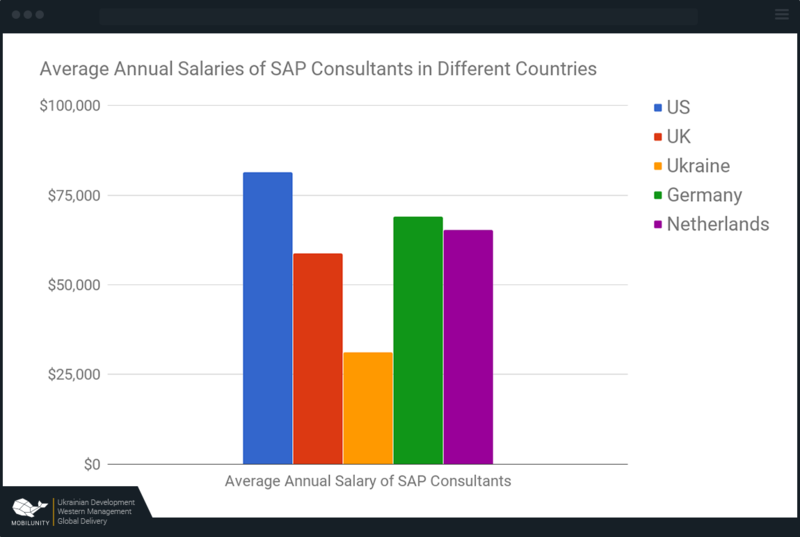 Compared to the average SAP® consultant salary in USA, as well as SAP ABAP developer salary for instance, hiring from Ukraine will give you around 62% savings in cost. 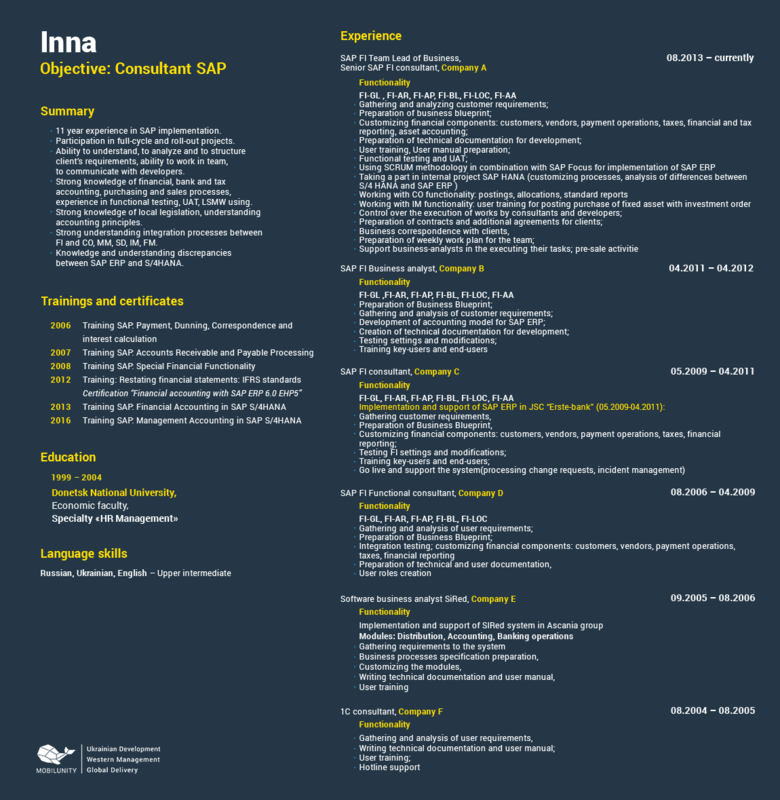 To give you a clearer picture of the typical skill set and experience of actual SAP® consultants, here are three sample SAP® consultant CVs. SAP® products offer businesses countless ways to improve their productivity and increase their profitability. SAP® consultants help maximize the benefits of SAP® systems by ensuring correct and optimal implementation and integration with other systems. 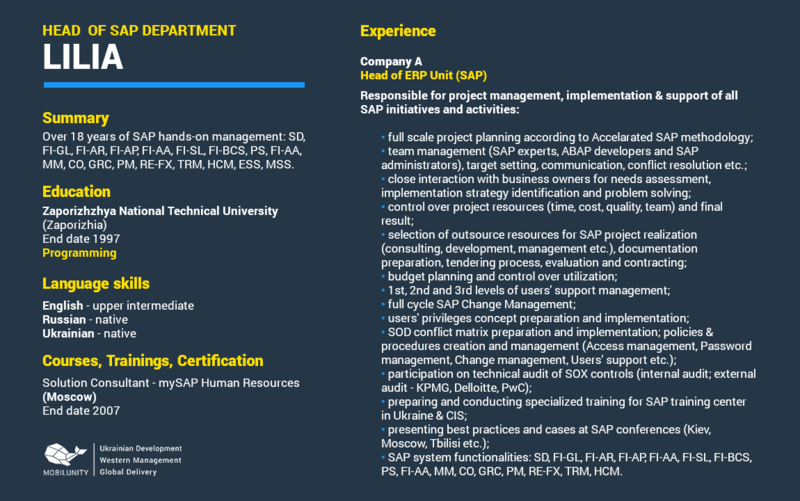 Now that you’ve learned a great deal about SAP®, its products, and details on the best and most economical way to hire SAP® consultants and specialists, it’s time to hire! Luckily, we’ve got you covered. Here at Mobilunity, we have Europe’s most talented IT professionals skilled in all the SAP® tools and many other technologies. Located in Ukraine, we also have one of the lowest rates across all of Europe, so you’re certain to get your money’s full worth. Disclaimer: SAP® HANA, SAP® Leonardo, SAP® Cloud Platform, SAP® ERP, SAP® CRM, SAP® Netweaver are the trademarks or registered trademarks of SAP SE in Germany and in several other countries.